A peaceful, poetic dragon is befriended by a book-loving boy and they spend many wonderful days together high up in the hills, until one day, when the townsfolk find out that there’s a dragon on their doorstep and call in a dragonslayer to help them! 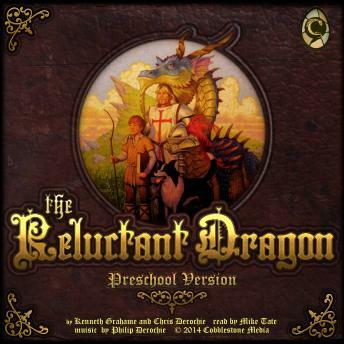 The Reluctant Dragon is a classic story from the author of The Wind In The Willows, about a Dragon and a Knight that don’t want to fight, a town that desperately wants them to, and a boy that tries to bring them all together. Adapted by Chris Derochie to be more accessible to preschool aged children, with modern language and shorter pages but still retaining the same story as the original version.